Dutch based DRU is active in gas as well as wood appliances and has a wide European network with own sales and service operations in many European countries. DRU is one of the oldest industrial companies in Europe founded in 1754. Glen Dimplex Benelux is part of the Glen Dimplex Group that was founded in 1973. Glen Dimplex is the world leader in electric heating. Besides electric appliances the group produces gas- and wood burning appliances. HKI is the German industrial trade organisation for manufacturers of domestic heating and cooking appliances. The organisation was founded in 1949. At the moment HKI has approximately 200 members. Italian based MCZ is a large manufacturer of pellet and wood appliances with distribution of its products all over Europe. The company was established in 1975. Swedish based NIBE-Stoves unites many stove manufacturers under its umbrella. They manufacture wood, gas and electric appliances in several European countries. Norsk Varme is the Norwegian trade organisation for wood burning and other biofuels. The organisation has as members manufacturers, retailers and other businesses that are related to wood and biomass. Italian based and family run Palazzetti is one of the largest companies in the field of pellet stoves and wood burning appliances in Europe. The company was founded in 1954. Austrian based RIKA is a specialist in pellet and wood burning appliances and appliances that combine the two fuels. It is one of the European leaders in its field in the local space heating industry. 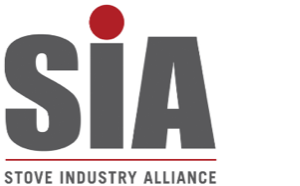 The UK based Stove Industry Alliance is an association of stove manufacturers and distributors, wood fuel suppliers, flue and glass manufacturers and industry supporters like HETAS and Kiwa. SIA has 40 members. NHK is the Dutch based industrial trade organisation for manufacturers, importers and installers of local space heaters on gas, wood, pellet or electric as well as flue systems and fire wood suppliers. The organisation currently has 30 industry members and over 100 installation companies. Stûv is based in Bois-de-Villers, in the Namur province of Belgium, Stûv designs, produces and markets individual wood, gas and pellet heating solutions. The company was established in 1983.